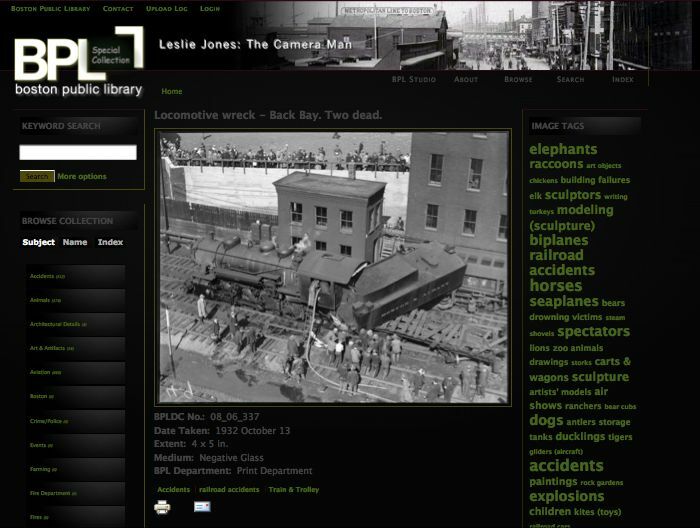 The current digital library is a re-build of a previous site that I voluntarily developed in 2009. That site was built using the Drupal 6 content management framework. 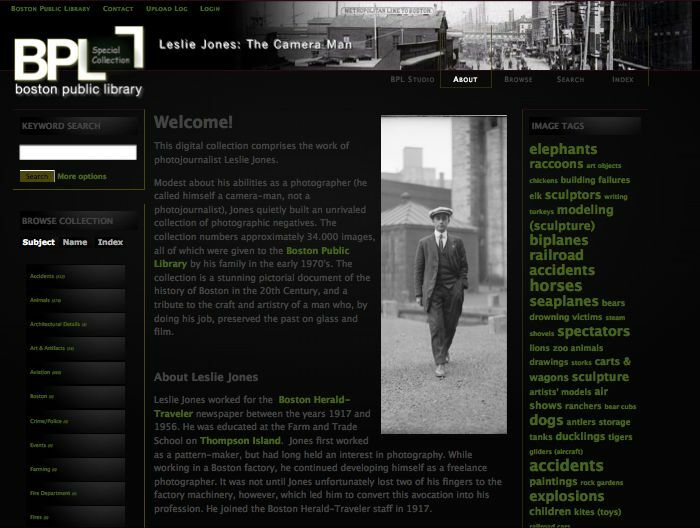 It functioned really well over the years and brought the Boston Public Library a steady stream of "customers" interested in images from the Leslie Jones Photography collection. 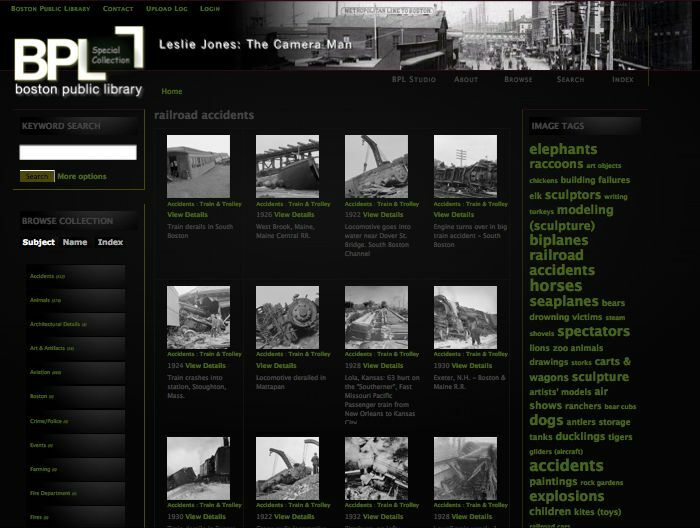 Nevertheless, its metadata element set was incomplete, as was the collection of images (each image had to be uploaded separately). In remembrance, a few images of the previous site are found in the section at the end of this page. In April of 2013, while participating in a graduate metadata course (IST681) with Professor Jian Qin of Syracuse University School of Information Studies, I decided to rebuild the site using the upgraded and much improved Drupal 7. Many thanks go to Professor Qin and her book "Metadata" (with Marcia Zeng, found at www.metadataetc.org) for assisting me in the development of a quality metadata element set that utilises a formal schematic structure and provides an interoperable framework for sharing and harvesting the digital objects in the current collection. While on internship at the Boston Public Library (BPL) Digital Reproduction Studio in 2008, I digitised over 8,000 of the glass plate negatives you see on this site. However, I was only loosely associated with the development of the metadata element set. The original metadata schema was developed by Chrissy Watkins, Digital Library Metadata Librarian at the BPL. Most of the metadata was encoded by Monica Shin and Danny Pucci (currently Digital Project Librarians at the BPL). This is the metadata that describes the images on this site. 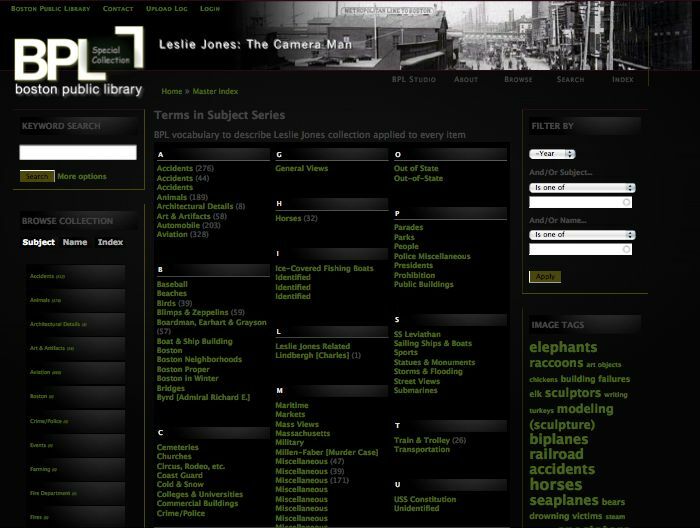 However, in order to build a fully functional and inter-operable digital library of the Leslie Jones Collection, and to fulfil some of the requirements of IST681, I re-described the metadata element set using the original set of 15 Dublin Core Metadata elements. It is this description that you see on the technical information sections that follow. It is unknown how much my ad hoc description of the element set coincides with that of the BPL. The current site has also been configured to allow for the bulk uploading of the images and their associated metadata using properly configured CSV files mapped to the field sets. Thus, I now upload 1000 images and their associated metadata in one go. In what follows I summarise the various sections that make up the technical information section, as broken down in the menu above. These sections outline according to formal library standards both the element set and a guide to applying the metadata elements to each of the digital objects. The latter is necessary if more than one library technician is uploading and describing each image. One new implementation of the current Drupal 7 site is the ability to upload hundreds of images and CSV demarcated metadata descriptions by way of batch-processed feeds (I managed this in batches of 1000). Unqualified Dublin Core was utilised in order to harvest (i.e., collect) the metadata descriptions making up each digital image record. The protocol developed by the Open Archives Initiative for Metadata Harvesting (OAI-PMH) was used in this respect. In this section, I describe how this protocol uses XML over HTTP in order that other institutions might harvest the current records into their own collection spaces. Drupal 7 also facilitates the application of W3C recommended RDFa standards. In this way, the Dublin Core elements and a few other vocabulary standards (e.g., SKOS, FOAF, and especially Schema.org) are embedded as attribute-level extensions to the HTML5 markup of each digital object node. In this last section, I attempt to provide a short tutorial on how this digital library was built using the Drupal 7 content management framework. While the tutorial does assume some basic knowledge of Drupal, its intention is to promote Drupal as an open-source digital library framework that is robust and easy-to-use for developing reliable and interoperable digital library collections. It is also worth mentioning that the current website makes use of a recent principles of responsive design. It has been developed to dynamically resize in order to accommodate standard, tablet and smartphone layouts.